To make the owl face, I adhered the plain black marquee shape over the white center of the dotted marquee frame. Then I took two of the black/white cakes, and trimmed off the ends of the strawberries so they wouldn't stick out. For the eyes, I punched the smaller of the balloons from the Balloon Bouquet Punch out of one of the Lovely Lipstick adhesive-backed piece in the kit, and snipped it in half down the center, then I cut the little balloon stem off each side. The pupils of the eyes are from the center of the 'a' in the gold Hooray stickers, and the nose is from the center of the loop in the 'y'. 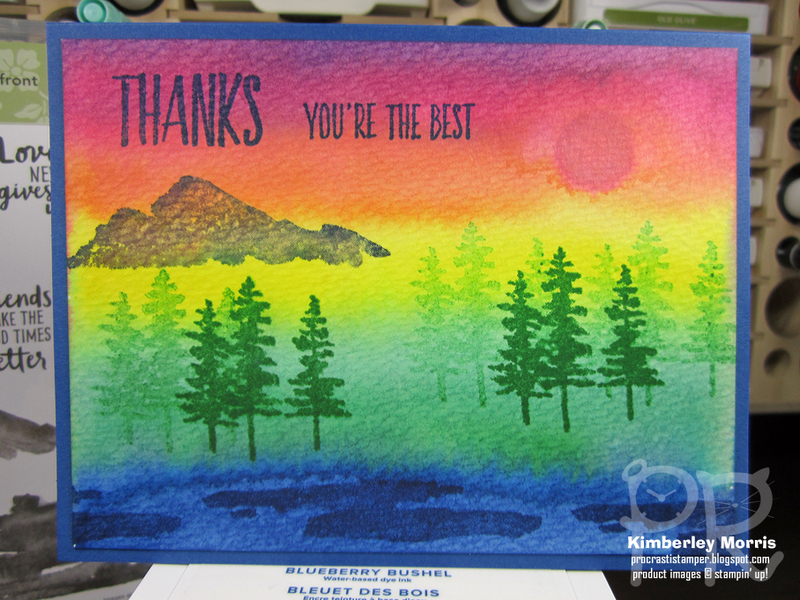 I stamped the accent "stars" on the card base for a little bit of texture. I used the VersaMark ink pad for mine (because I also planned to use it for two other color card bases), but you could just use the Lovely Lipstick ink pad that came in the kit as an ink spot. The owl's "wings" are just an envelope flap I cut off, which I then cut in half, stamped the accent "stars" with a StazOn Jet Black ink pad, then tucked behind the Lemon Lime Twist banner to stick out at an angle. 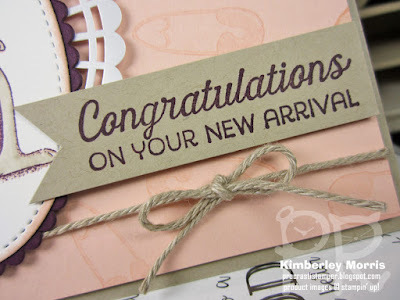 The greeting was also stamped in black, on a die cut included with the kit...I just cut the piece a bit short to match the saying length. The Laffy Taffy candy treat is simply wrapped with a little piece of one of the card bases from the kit, then I punched a small balloon from the Balloon Bouquet Punch out of Lovely Lipstick Cardstock. You could go ahead and punch that out of the adhesive-backed Lovely Lipstick piece from the kit, but I didn't want the adhesive on the back of mine. 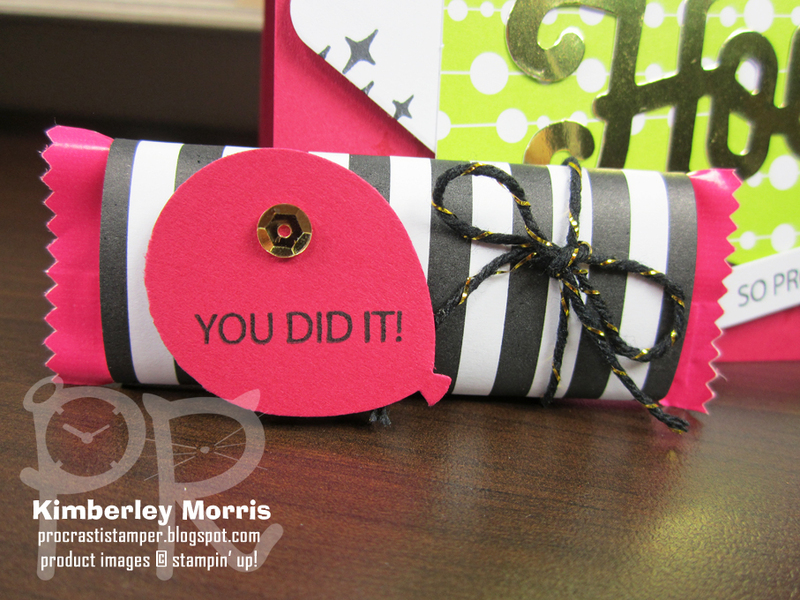 I stamped the greeting on the balloon, added a little gold adhesive-backed sequin from the kit, and adhered it to the candy wrapper with one of the Mini Stampin' Dimensionals, a sheet of which was also included in the kit. I finished it off by tying a bit of the included black/gold twine from the kit, around the candy. The bubbles had a little princess sticker on them, so I just covered that with one of the adhesive-backed balloon die cuts from the kit. 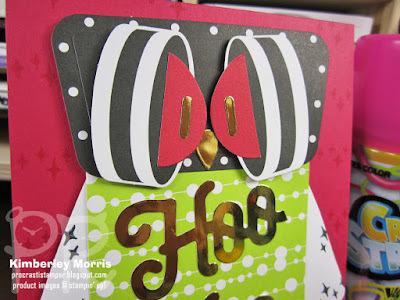 You could alternately stamp TWO of the smaller balloons from the Balloon Bouquet Punch out of Lovely Lipstick Cardstock, and adhere them on the front and back of the round tab of the bubbles. Since the balloon is symmetrical, it would line up front to back nicely, with the tab in the center. The punched balloons are also great for cupcake picks for this same reason. Just as an FYI, this month's kit coordinates with the Broadway Bound Suite of products in the NEW Stampin' Up! 2018-19 Annual Catalog that debuted at the beginning of this month. You might want to check that out if you like this kit's color combo and style! Stampin' Supplies: June 2018 Broadway Star Paper Pumpkin Kit, Lovely Lipstick Cardstock, Balloon Bouquet Punch, SNAIL Adhesive, Paper Snips, Stampin' Trimmer (for trimming and scoring). The Broadway Star Kit REFILL is available right now the on the PAST KITS page in my Online Store. There are sometimes full Kits available on that page, but many are just Refill Kits which include the consumables only...meaning everything but the stamp set & ink pad. By the way, you're gonna have to be a Paper Pumpkin subscriber to buy whatever's available on that PAST KITS page, so go ahead and sign up HERE to get your email address in the system first! 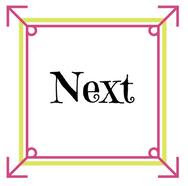 NEXT UP: Click the Next button below to see the projects starring on Melissa Davies' blog! 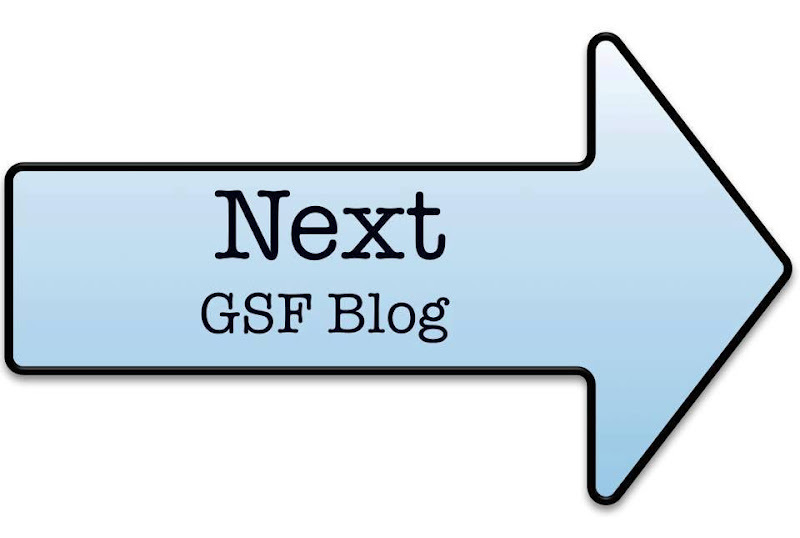 If you have any problems navigating the hop, there is also a Blog Roll listed below for your convenience. Remember how I said you might want to go ahead and SIGN UP for Paper Pumpkin now?? You'll definitely want to do that before July 10th--which is the deadline to sign up to get next month's kit! I'm gonna be brutally honest with you, Blackberry Bliss might be one of my least favorite of our current colors. I know, right?!? I totally heard a collective gasp from the Blackberry Bliss fan club. I can't help it, I'm a last minute stamper (hence the name 'procrastistamper') and Blackberry Bliss is a color you just can't rush. If you don't handle the stamped color like a fragile little princess, it punishes you by smearing all over your project, your hands, your cat, and even some important piece of paper all the way across the room, somehow. And a little goes a LOOOOOOONG way, so I really only used a bit of it on my project. I have another confession to make...I usually don't use so many different products on one card. But the soft nature of the Petal Pink really called for one of the new, sweet Pearlized Doilies, the detailed outline of the Stitched Framelits, and the baby theme demanded the tiny scalloped outline of the Layering Ovals Framelits. I also used Stampin' Blends (Crumb Cake), as well as Blender Pens (with Petal Pink ink pad) to color in the kanga. 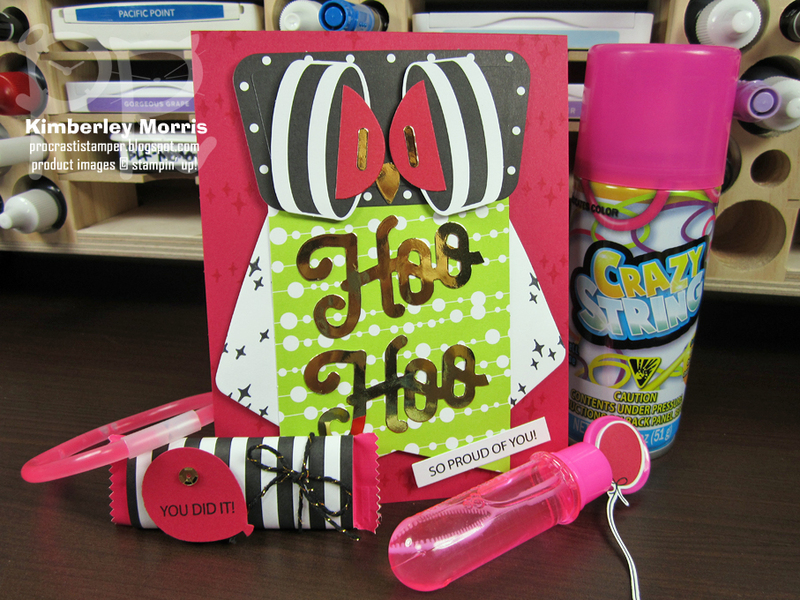 I first stamped it in Petal Pink, then did the coloring with Stampin' Blends. Then I lined up the stamp over the original, and stamped it again with Blackberry Bliss to get the darker outline. Then I used the Blender Pens with the Petal Pink ink to do the kanga's tummy. To finish it off, I used some Petal Pink sequins from the Basic Adhesive-Backed Sequins assortment, and the Crumb Cake twine from the Nature's Twine 4-Pack. 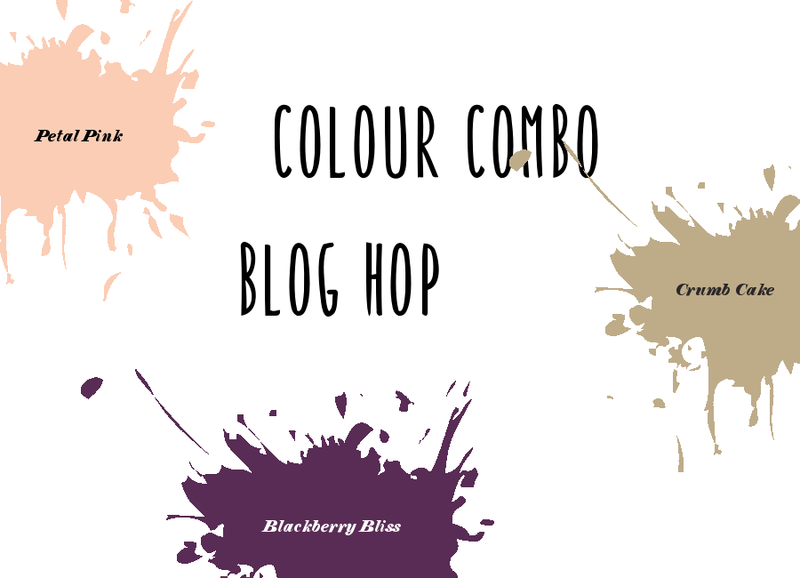 That twine pack also includes Blackberry Bliss, so you could also make the card using that color twine, with this same layout. 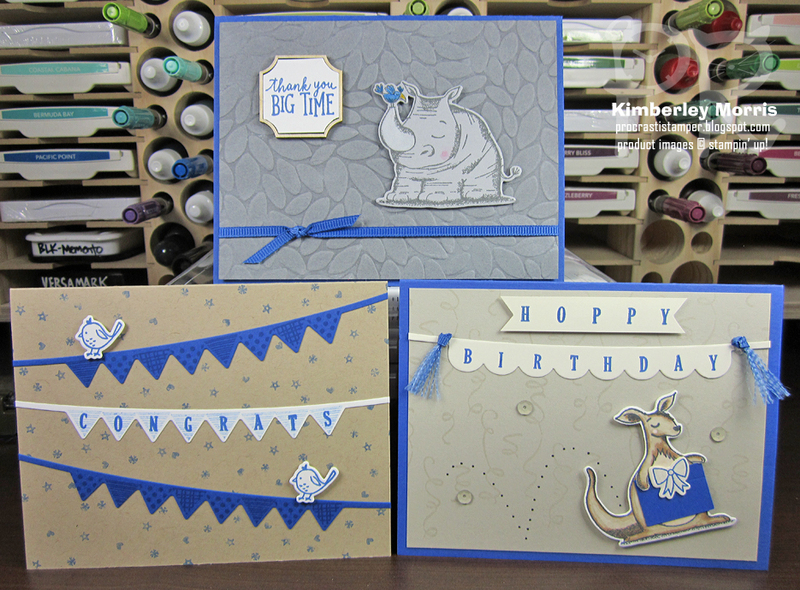 We hop the first Friday of each month, and my projects this month feature the Animal Outing, Birthday Backgrounds, and Pick A Pennant stamp sets. They are all available to order NOW in my Online Store! Click the image or link below to view/download the 2018-19 Annual Catalog PDF. 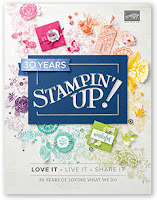 I was privileged to receive these three stamp sets a few months ago, to make display samples for the Stampin' Up! OnStage event at Las Vegas in April. 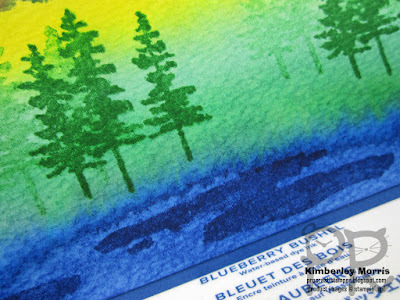 I love blue, so our new Blueberry Bushel In Color is all over these samples! 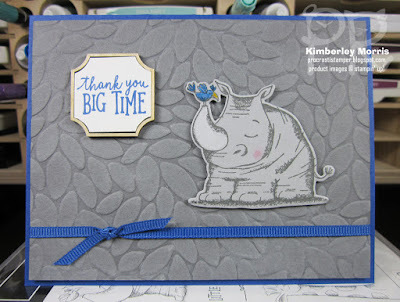 The rhino card features the Animal Outing stamp set and coordinating Animal Friends dies. I also used the Petal Burst Embossing Folder to get the "rhino skin" background. It actually came out of an accident. I ran a sheet of Basic Gray Cardstock through the Big Shot with the folder, and then I smeared a Whisper White Craft Ink Pad over bumpy side. I got way too much ink on there, and tried to wipe it off with a paper towel. It was still too much ink, so I just grabbed a baby wipe...and that's where the magic happened! The baby wipe roughed up the surface of the card stock and made it look like skin. Cool, huh? 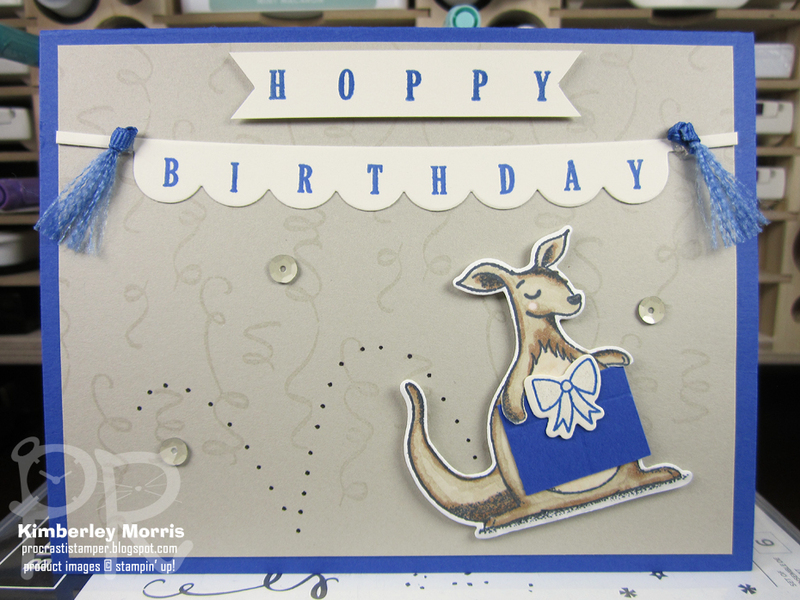 The kangaroo card features the Birthday Backgrounds stamp set...in the background, of course! 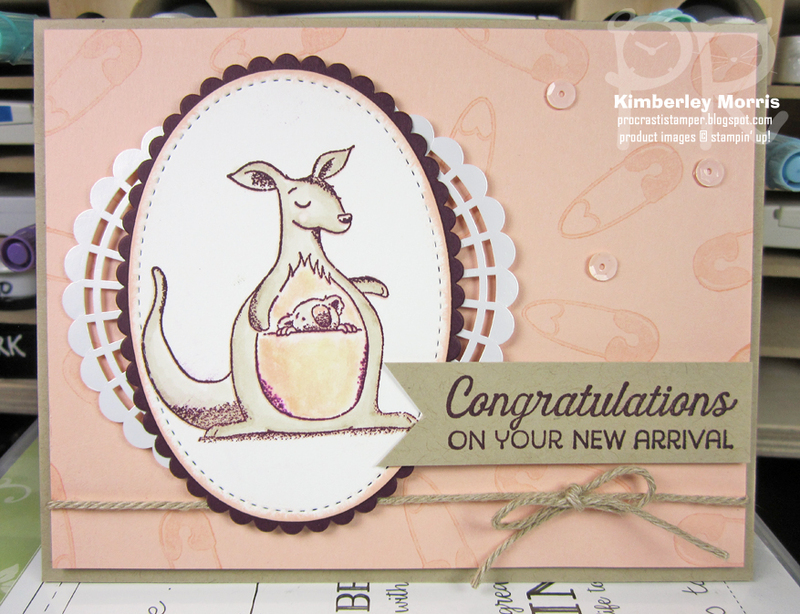 The kangaroo from the Animal Outing stamp set has a koala in its pouch for some reason, and I just wanted to use the kangaroo alone. So, I used my X-acto blade and cut around the two kanga "hands" so I could pull them up a little, then I cut out a rectangle of card stock to use as a gift box. 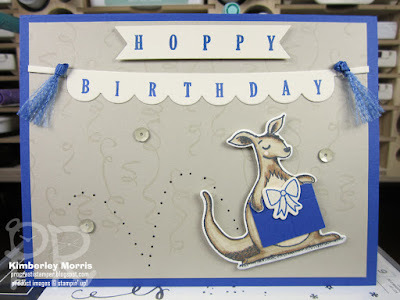 I tucked the box under the kanga paws then stamped and die cut a bow from the Playful Pennants stamp set, and you can't even tell there's a koala there. 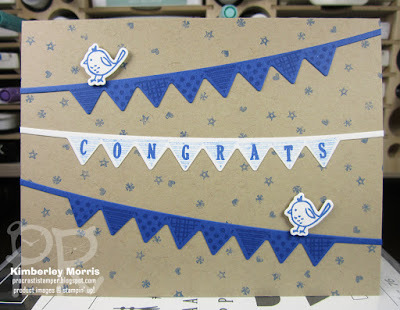 The alphabet from the Playful Pennants stamp set helped me create the custom greeting! This last card features the Pick a Pennant stamp set and coordinating Playful Pennants dies. 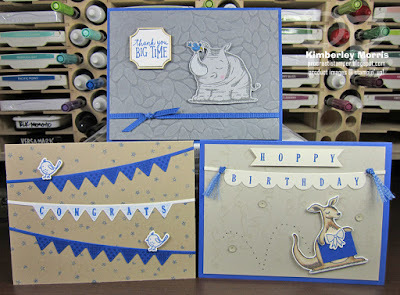 There's nothing tricky about this card, the stamp set and dies do all the work for you. One little tip, though - I stamped the Blueberry Bushel ink off the background stamp once each time before I stamped it on the card background. That kept the background from being as dark as the Blueberry Bushel card stock, so it wouldn't compete for focus. Oh, I did the same thing with the little lined triangle image underneath the word 'congrats'. 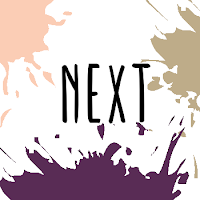 That way, it's full strength/darker ink for the letters, on top of stamped off/lighter ink of the same color. Let me know in the comments if you have any questions...and don't mind me while I go order a bunch of NEW stamps I've been dying to get...! Stampin' Supplies: Animal Outing stamp set with coordinating dies, Pick a Pennant stamp set with coordinating dies, Birthday Backgrounds stamp set, Better Together stamp set, Blueberry Bushel ink pad & card stock, Basic Gray ink pad & card stock, Memento Tuxedo Black ink pad, VersaMark ink pad, Stampin' Blends, Basic Black Marker, Watercolor Pencils, Sahara Sand card stock, Smoky Slate card stock, Crumb Cake card stock, Whisper White card stock, Very Vanilla card stock, Basics Adhesive Backed Sequins (Sahara Sand), Blueberry Bushel Ribbon, Petal Burst Embossing Folder, Wooden Frames Elements. 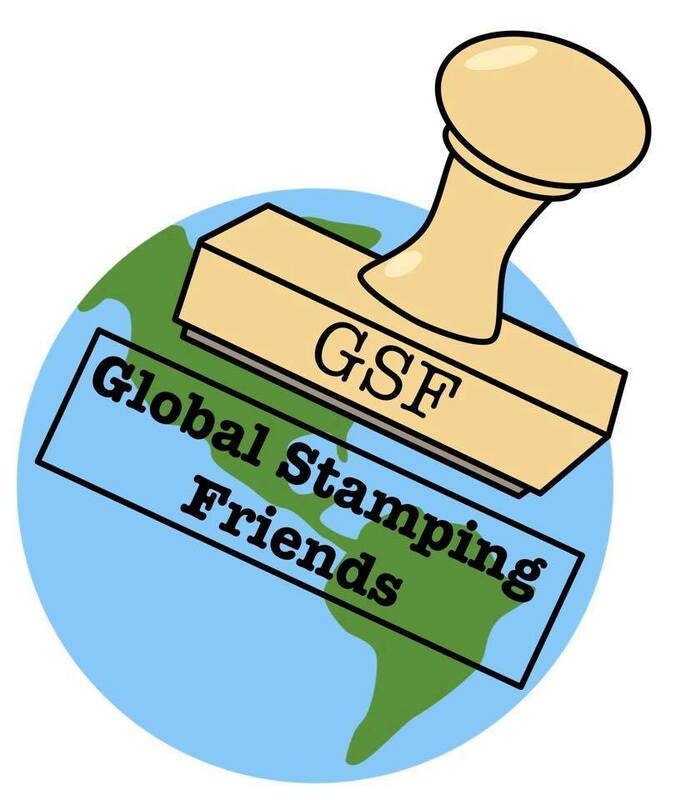 If you are in the US and you want to get a hard copy of the NEW Stampin' Up! 2018-19 Annual Catalog, drop me an email with your mailing address, and we can get that coordinated! Click the Next arrow below to see Tricia's NEW Catalog creations! Welcome to the June 2018 We Create Masculine Blog Hop!!! My cards for the hop feature the Waterfront stamp set, and all FIVE of the NEW 2018-2020 In Colors: Grapefruit Grove, Lovely Lipstick, Pineapple Punch, Blueberry Bushel, and Call Me Clover. 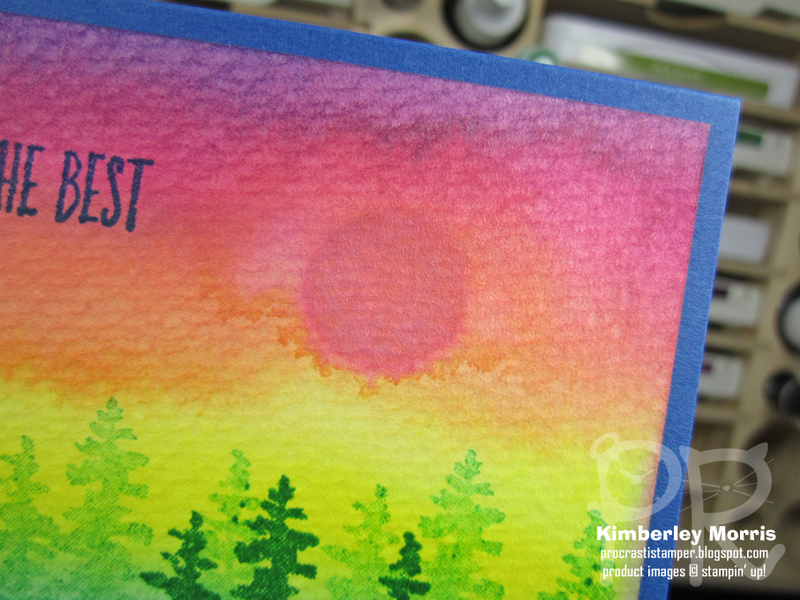 This card is just one layer of Watercolor Paper, on top of a foldover base of Blueberry Bushel Card Stock. I ran a wet AquaPainter over the whole front of the Watercolor Paper to prime it, then I dipped the AquaPainter into some drops of Blueberry Bushel Reinker and dragged the color across. I rinsed out the brush (by squeezing water through it and dabbing onto a paper towel), then dipped the AquaPainter into the next color and dragged it across, etc...always making sure the brush was clean before adding the next color. After the background was dry, I dropped some ripples in the water using a stamp with the Blueberry Bushel Ink Pad. I dropped in some trees using the Call Me Clover Ink Pad, stamping some full strength, and stamping others off once on my Grid Paper before stamping down on the card. 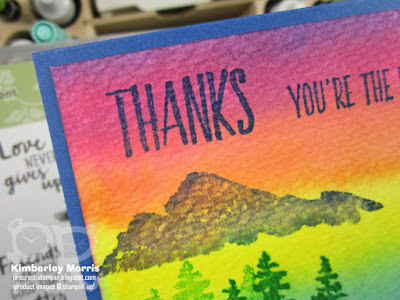 The greeting was stamped with the Blueberry Bushel Ink Pad, using different parts of sayings from the All Things Thanks stamp set (available in wood-mount & clear-mount). I generally get the wood-mount sets, but I got this one in clear-mount so I could cut the sayings apart and mount different pieces together on one block. In the picture below, you can see the sun image I stamped. For this one, I actually stamped it while the background was still slightly damp. 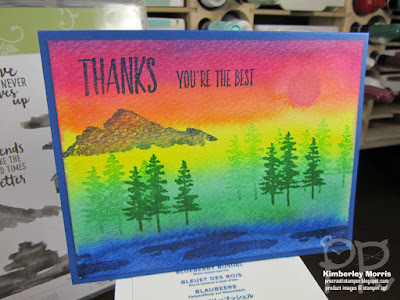 I mixed some of the Lovely Lipstick Reinker, and some of the Grapefruit Grove Reinker, and applied that color to the sun stamp with the AquaPainter Then I stamped it down. 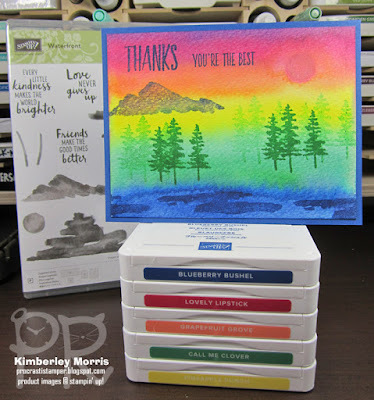 Stampin' Supplies: Waterfront stamp set, Watercolor Paper, Aquapainter, Blueberry Bushel card stock, Blueberry Bushel ink pad & Reinker, Call Me Clover ink pad & Reinker, Pineapple Punch ink pad & Reinker, Grapefruit Grove ink pad & Reinker, Lovely Lipstick ink pad & Reinker, SNAIL Adhesive, Stampin' Trimmer (to cut & score card stock).